Spawn Series 20: Classic II houses six of the most popular McFarlane comic book characters, each sculpted using the two-dimensional comic book artwork as reference. Detailed. Articulated. Accessorized. And entirely based on the Spawn family of comic books. 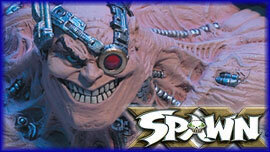 Hey, when Spawn fans talk, McFarlane Toys listens.